The Collective Security Treaty Organization (CSTO) follows the instructions from President Dmitry Medvedev, who ordered to increase the military constituent and develop the coalition force development. A strong military group, which may appear in Central Asia in the nearest future, will make the CSTO become an analogue of NATO. The following post-Soviet countries are included in the treaty: Armenia, Belarus, Kazakhstan, Kyrgyzstan, Russia, Tajikistan and Uzbekistan. The question about the establishment of collective rapid response forces within the scope of the organization has been practically solved. The Russian administration is now working on a much larger project, The Kommersant newspaper wrote. A large group of troops is to be deployed in Central Asia in addition to Russia-Belarus and Russia-Armenia groups, which already exist within the scope of the CSTO. A package of documents has been prepared and will be coordinated with Kazakhstan, Kyrgyzstan, Tajikistan and Uzbekistan soon. “The work is being conducted in all directions. It will be a purely military structure that will be set up to maintain security in Central Asia in case of attack from the outside,” a source from Russia’s Foreign Ministry said. 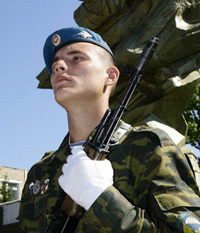 The number of servicemen of the new group is unknown. Vitaly Strugovets, the press secretary of the CSTO, only said that the group would consist of the units of five countries – Kazakhstan, Kyrgyzstan, Russia, Tajikistan and Uzbekistan. The creation of the military group in Central Asia corresponds to Moscow’s objective to make the CSTO become a pro-Russian bloc, the military power of which would be similar to that of NATO. The National Security Strategy of the Russian Federation till 2020, approved by President Medvedev, says that Moscow views the Collective Security Treaty Organization as the key instrument to counter regional challenges, political and military threats. The document also says that the struggle for the energy sources on the Caspian Sea and in Central Asia may lead to armed conflicts in the region. The presidents of the OCST member countries are to sign the agreement about the establishment of the rapid response forces within the scope of the organization on June 14. The decision to establish the rapid response forces was made on February 4. Moscow will provide an airborne division and an air assault brigade – about 8,000 servicemen. Kazakhstan will provide 4,000 military men of its air assault brigade too. Each of other allies will limit themselves to one battalion. The military group in Central Asia will be necessary in case of a serious threat is posed to the territorial integrity or in case of war. The rapid deployment forces will also be used to suppress small armed conflicts in the region.